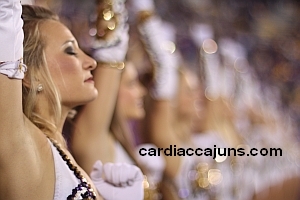 pic above: LSU Golden Girls Dance Line at Tiger Stadium. links to most recent LSU Golden Girls pics below this slideshow of Golden Girl pictures. Slideshow format offers pictures at a higher resolution. The current name of Golden Girls did not become official until six years later. They perform at all home football games and travel to away games with the full Tiger Band. The Golden Girls celebrated their 50th anniversary with their 51st line in 2009. Over 200 former Golden Girls performed on October 31, 2009 in Tiger Stadium during halftime of the Tulane - LSU game.